All materials will be accessible from the IFT Learning Portal in electronic format. No items are shipped to you. IFT Topic Exams will test your preparation at the topic level. A quiz should be taken after you have studied all readings of a given topic and also have completed practice questions for each reading. This is an essential step in for preparing for the exam. When you are stuck on a problem, example or concept, then Q&A with IFT instructor is where you can turn to! Submit your query, and an IFT instructor will provide an individualized response within 48 hours. You will also be able to see Q&A from other premium students via our online forum. We use a private forum hosted on Linked-In, so you will have to sign up for free account on Linked-In. If necessary IFT will make a video to clear any confusion you have. -This professional service will allow you to ask up to 30 curriculum or IFT material related questions. -The origin of the questions asked as part of this service need to be either CFA Institute curriculum or materials or IFT published materials. Questions from a 3rd party will not be answered. 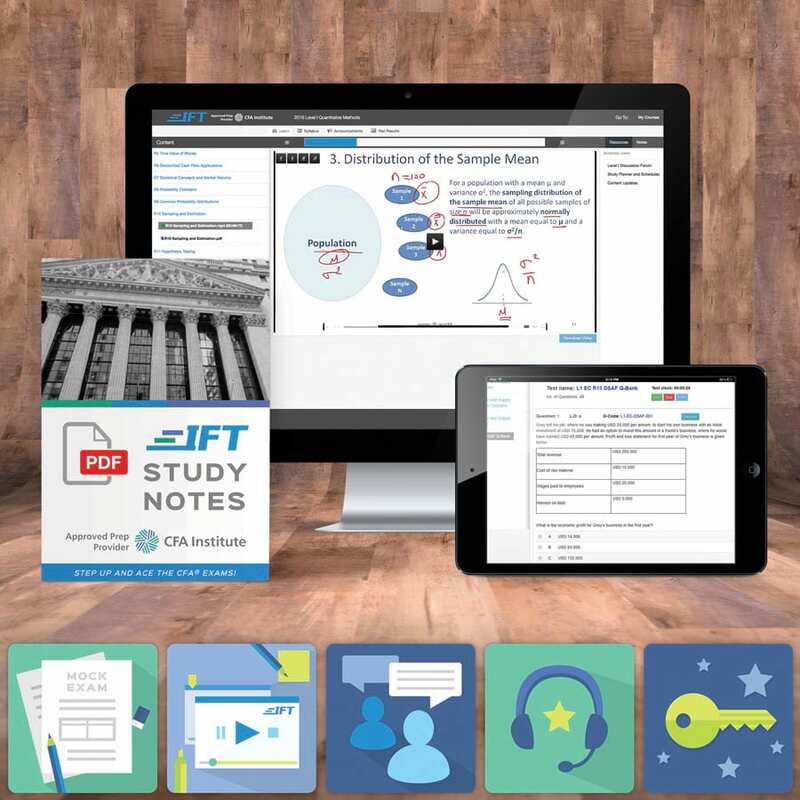 “Pay only once till you Pass” IFT is confident that the premium exam prep package will greatly improve your chances of success on your exam day. However if you don’t pass then with ‘Pass Protection’ we offer access to updated premium package materials until you ‘do’ pass the exam. Simply contact our team once you get your result. *Please note that the following is not included in Pass Protection: 1) New IFT products which were not in your original purchased package 2) Services from IFT such as Q&A with Instructor and Grading service, etc. As a priority customer, you will get extra attention from our support team via email, Skype or phone. Three full length mock exams to get you exam ready. Allocate 6 hours to do each mock exam. Provided in a downloadable and printable PDF format.